With just 8 laps remaining in stage 2, Christoper Bell and Grant Enfinger were the lone trucks to stay out after a late stage caution. The plan for Bell was to collect stage points. Enfinger was back to 4th before turn 1. However, Christopher Bell somehow held off the field. On old tires. The caution came back out with 3 to go. Christopher Bell was forced to hit pit road. He pitted from the lead, just laps before the conclusion of stage 2. Johnny Sauter coasted to the stage 2 win. 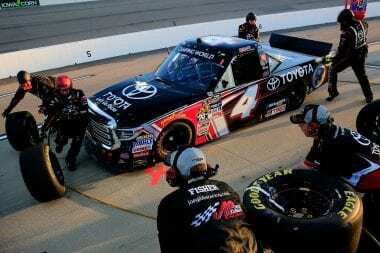 More trouble for Ben Rhodes in stage 2. He was three side down the back straight away. The car at the bottom was clipped by the car in the middle. The bottom car was pointed directly toward the outside wall. Rhodes stopped him before he got there. Pancaked the left side of Rhodes. With just 32 laps remaining in the race Ryan Truex hits pit road. It’s terminal, blown engine. 18 laps to go, Chase Briscoe chasing down leader Johnny Sauter. He catches him in turn 3, drives around on the outside. He only has 1 full year of stock car racing under his belt. That doesn’t matter, Chase Briscoe is at the front, week after week. Caution. Matt Crafton is in the wall hard. Grant Enfinger closed on Matt Crafton quickly. He went to the inside, an alternative lane chosen from laps prior. 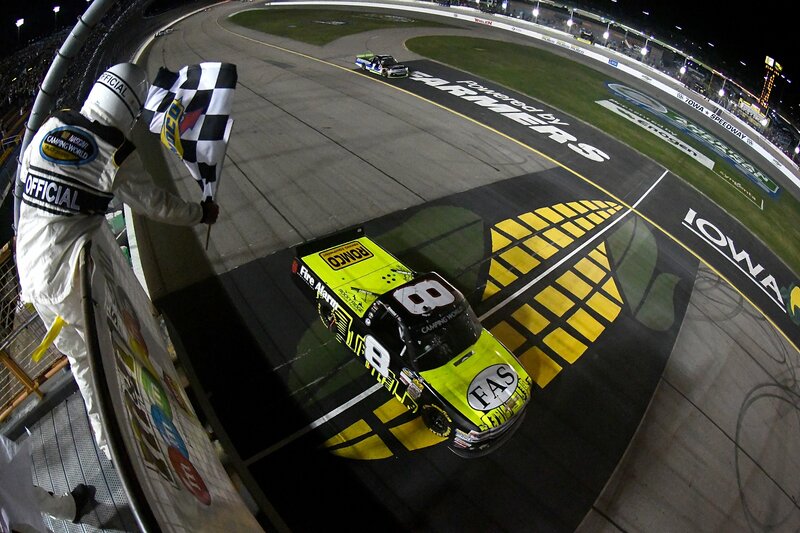 Matt Crafton was taken by surprise, he came down on Enfinger. They connected, Crafton backed it up the banking and into the wall hard. Green, 7 to go. Chase Briscoe to the bottom, Sauter high. 4 wide behind them. Sauter is carrying a ton of momentum off the top, Briscoe can’t get it done on the exit. As those two run side-by-side, they slow each other down. John Hunter Nemechek is running them both down. He’s the first car that took 4 tires. Nemechek to the bottom, he clears them both. Makes it look easy, new leader. 3 to go, Briscoe is slipping. He’s under attack for 3rd. A whole collection of trucks move by him at once. 4 tires was the correct answer on the last pit stop. 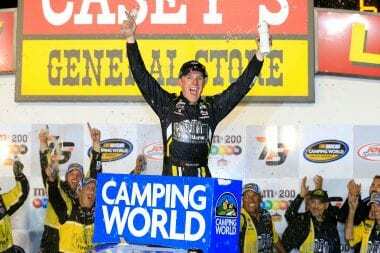 John Hunter Nemecheck goes back to back in the NASCAR Camping World Truck Series. He wins at Iowa Speedway! He takes the same truck to victory lane. Justin Haley and Harrison Burton wreck off turn 4 before the start finish line. Burton drove it in deep, battling for a top 5 run. He got loose, lost it. He then went backwards up the race track, collecting Haley. Jordan Anderson finished 15th. Tying his best NASCAR Truck Series finish. 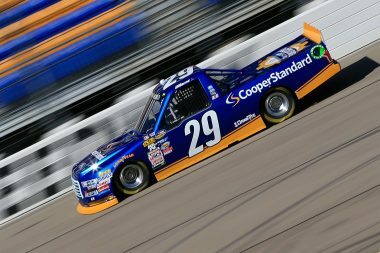 View full Iowa Speedway NASCAR Truck Series results below.